My mom taught me to make chicken noodle soup with a can of cream of chicken in it to make it a little bit creamy. Lately I've been making my own chicken gravy (recipe to come soon) instead of cream of chicken soup, so I don't have any on hand anymore. I wanted a way to make my chicken noodle soup still a little creamy, so the other night I did some experimenting. Mahon pronounced this "the best chicken soup" he'd ever eaten, and we both were practically licking our bowls by the end! The tiny hint of chili powder gives it just the barest, most subtle kick and helps round out the flavor beautifully. 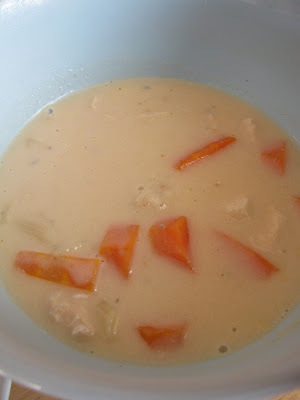 If you want it less creamy, halve the roux mixture and add a little more broth or water. In medium saucepan, melt butter and sautee onion, pepper, and garlic on medium-high heat until just barely brown (about 2 minutes). Add 1/8 t. chili powder. Add in flour and stir quickly to combine. Cook a minute or two, until mixture is thick and bubbly. Turn heat down to medium, add in milk and stir to combine. Cook, stirring constantly, for about three minutes or until mixture is thick and bubbly. (Cooking hint: This is called "making a roux", pronounced "roo." A roux, or basic white sauce, is the basis of a lot of recipes!) Add in chicken stock and stir until stock and roux are well-integrated. Turn heat down to medium-low and add carrots, celery, chicken, salt, and pepper. Cover and let simmer for about 20 minutes, or until carrots are just barely tender. Turn heat back up to medium-high, add pasta, and cook until pasta is done. Serve with bread (we made a version of the 5-minute boule using about 1/2 wheat flour, and it was delicious!). A great rainy day meal! Freezer instructions: Omit milk and freeze; add milk while cooking after freezing. Best soup ever! I've been trying to replicate Grandma Head's soup, and this recipe did the trick. I love the chili powder.